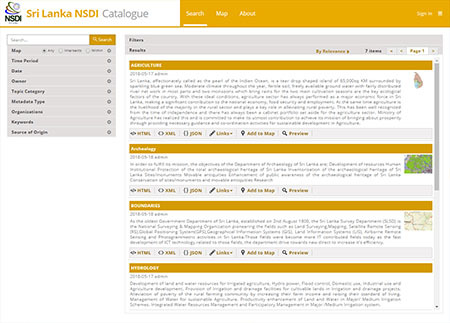 A Metadata Catalogue Service is a mechanism for storing and accessing descriptive metadata and allows users to query, for data items based on desired attribute, the catalogue service that stores descriptive information (metadata) about logical data items. The Open Geospatial Consortium (OGC) has created the Catalogue Service for Web (CS-W) standard to enable discovery from a catalogue node. Catalogue services support the ability to publish and search metadata for data, services, and related information. Metadata in catalogues can be queried and presented for evaluation and further processing by both humans and software. Catalogue services are required to support the discovery and binding to published web map services. The CS-W standard is extremely rich. In addition to supporting a query from a user, it can support distributed queries (one query that searches many catalogues) and the harvesting of metadata from node to node.